Looking for a hassle free and enjoyable shopping experience with a wide range of brands and products? Get ready to splurge as we have a one stop shop for all your fashion and lifestyle needs. 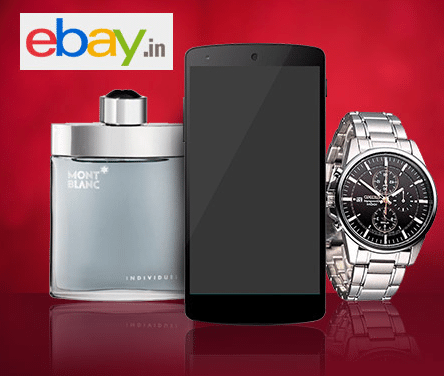 eBay.in is an Indian e-commerce company of fashion and casual lifestyle products which understands its shoppers’ needs and caters to them with choice of apparel, accessories, cosmetics and footwear,jewellery,sunglasses from over 500 leading Indian and international brands. Prominent brands include Adidas, Nike, Puma, Catwalk, Inc 5, United Colors of Benetton, FCUK, Timberland, Avirate, FabIndia and Biba to name a few. ICICI Bank in association with eBay.in brings to you an exclusive deal that will make your shopping extravaganza seem like a fun filled carnival. Promo code: Unique codes for individual customers. Make payment through the Pockets wallet. Valid upto March 31, 2015. For more details on Pockets and to download the pockets app, click here.